We’re sad to announce that Lisa King is stepping down as the conductor of our fabulous Development Band due to other commitments. Lisa has conducted the band since it started two years ago and her energy and enthusiasm have inspired many new and returning players – thank you Lisa! 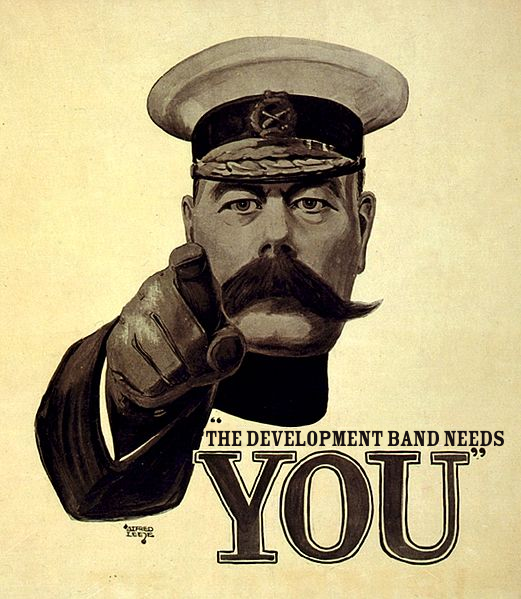 This means we are recruiting for a new volunteer to lead this successful beginner band. If you would like to take up the challenge, please contact Charmian Flowerday using our contact form by Monday 2nd October. For the full story of the what the role entails, take a look at the job description. For the uninitiated, brass band contesting can seem crazy – and it is a bit. You spend about 4 months (on and off) practising one piece of music which culminates in 10 minutes of performance on stage to a pair of judges in a curtained cubicle. On the plus side, it gives a band the chance to really get under the skin of a piece and to concentrate on technique. It brings the band together and puts a bit of pressure on us to perform – and it’s also a good day out! This year – After a last rehearsal in the morning of Sunday 19th March – we made our pilgrimage to the Gordon Craig theatre in Stevenage. The fourth section is quite big (18 bands) so it’s split in two and we were in the first half of the draw. We had a little time before going on which can be spent listening to other bands, catching up with friends or looking at shiny new instruments for sale (and trying to resist the temptation to purchase). We went on stage as prepared as we could be and I was genuinely excited. We played. We waited.. and in the early evening we heard: 6th place! The result was a good one for the band, and it’s a nice reflection that the band is secure in its new bandroom; we have a healthy number of regular members and an experienced conductor. Who knows what we could achieve next year, but for now bring on the summer programme! One of the highlights of the year for us – as a voluntary group – is to be able to share some of the money we raise at Christmas with other local good causes that provide essential services in Royston. Last week we were immensely proud to be able to present a cheque for £700 to Royston Day Centre which provides a friendly atmosphere where up to 25 older less able-bodied or housebound clients can meet and socialise each day. This will directly benefit the various groups who use the centre, including Royston Community Transport, Stroke Support and Speech Therapy, and Royston Homestart. Our thanks goes out to everyone who supported the band over Christmas; you have made a difference to not just one, but two good causes! If you’d like to hear more from the band we’d be delighted if you would join us for our next concert at the Parish Church on the 27th May at 7.30pm.